If you are a mid-size firm, spanning the middle market between the smaller companies and the bigger enterprises, then you are at the right place. From data integration and customization to automating processes such as payroll, accounts payable, and inventory management, we have the right set of expertise required to boost your organizational efficiency and to take your business to the next level of success. We have an art of technology and the science of desire! Cooperative Computing is excited to take mid-sized and smaller companies along with us on our quest for outstanding achievements. No matter who we work with, Cooperative Computing focuses on cutting down on the delivery cycle. Get free consultation on your project idea. Thorough Development Solutions For Mid-Sized Businesses. We specialize in developing completely custom web applications and stunning websites that match the needs of any size of organization. 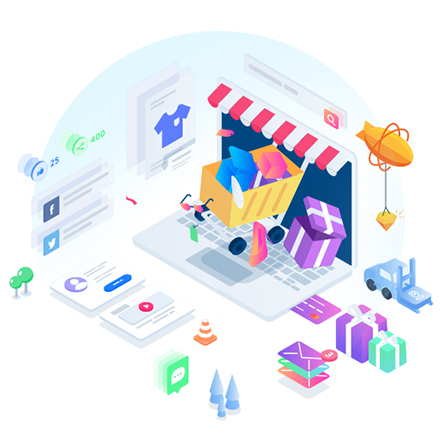 Our expertise in developing e-commerce eco-systems ensure flawless management of products, orders, sales, and inventory with secure integration of payment gateway. We design and develop seamless, highly engaging, user friendly, and scalable mobile applications that get featured in AppStore and GooglePlay Store. We also realize that your user interface design needs to be aligned with your brand message so that it can be heard globally. Our efficient solutions are designed to minimize your technical overhead & drive more productivity.